This story is updated to include the Friday games. CLARION, Pa. – Then there was one. 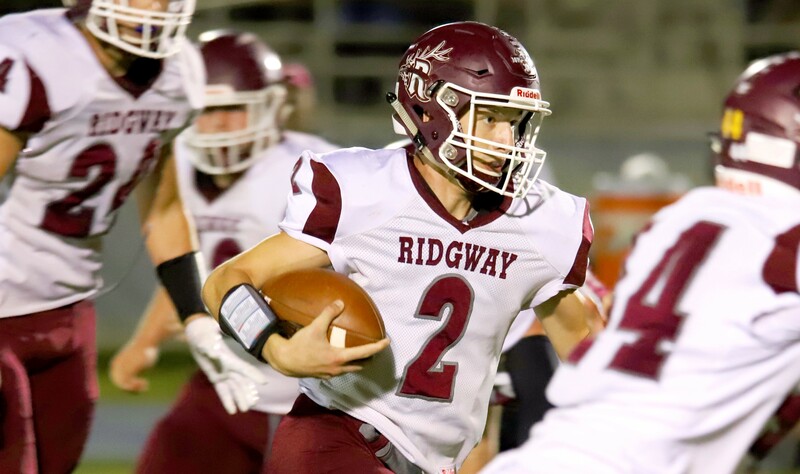 Ridgway became the final D9 League Large School Division team to remain unbeaten after a workmanlike 28-15 road win over Clarion. 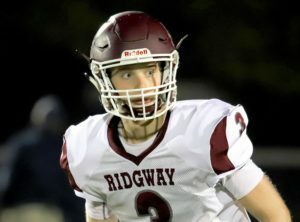 The contest was a classic Elkers victory, as Ridgway (7-0) used a strong defense, balance defense and great field position to hand Clarion (6-1) its first loss of the year. The strong defense came in the form of allowing Clarion just 228 yards of offense including only 96 on the ground. The balanced offense came in the form of seven different Elkers touching the ball but done having more than the 80 totals yards of offense by Jake Wickett (40 rushing, 40 passing). And the great field position was thanks to strong special teams that included a nice return of the opening kickoff and then a punt downed inside the 2-yard line after the initial drive stalled. That punt allowed Ridgway to maintain good field position and set up an opening 1-yard touchdown run by Evan Furlong. Furlong also scored the Elkers third touchdown of the game late in the first half that gave Ridgway a 21-0 lead at the time. He finished with nine carries for 30 yards and a score and one catch for 10 yards and a touchdown – from Paul Gresco – but did leave the game midway through with an apparent arm injury and was in a sling after the game. Gabe Watts also scored twice on the ground for Ridgway and ran 10 times for 39 yards. Daunte Allegretto, who played a key role in the defensive effort by Ridgway talked about the win. Clarion got some life just before halftime on a 3-yard Logan Minich touchdown run that got the Bobcats back within 13, 21-8, at the break. But Ridgway scored on the first drive of the second half courtesy of a 4-yards Watts run to keep Clarion at bay. Logan Minich did take on a late 12-yard touchdown catch off a throw from Calvin German late for the Bobcats and finished with 37 yards rushing on 14 carries and 20 yards receiving on five grabs. 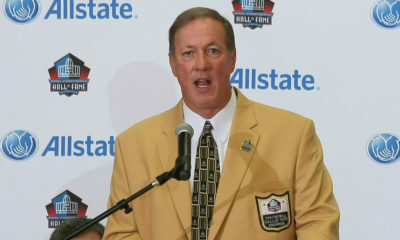 His twin brother, Sam Minich, had eight catches for 102 yards. Archer Mills was 14 of 23 passing for 132 yards and two interceptions. German’s only pass was the touchdown. PORT ALLEGANY, Pa. – A 30-point second quarter helped Port Allegany to a 30-12 victory on Homecoming over visiting Sheffield. Trey Ayers threw for two touchdowns to Issac Smoker and Josh Rees ran for 155 yards and a touchdown on 28 carries for the Gators (1-6 overall, 1-3 D9 League Small North). Ayers was 12 of 23 for 123 yards, and Smoker had five catches for 59 yards. 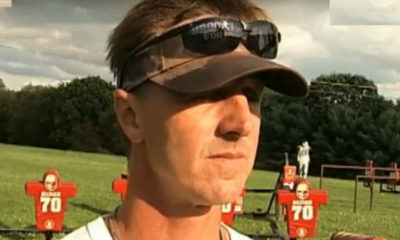 Ayers also intercepted two passes on defense. Eli Petruzzi also returned an interception for a touchdown for Port Allegany. Caden Smead caught a 61-yard touchdown from Steve Lojewski, and Christian Richetti ran for a 3-yard touchdown for Sheffield (0-7, 0-4). Lojewski was 10 of 35 passing for 169 yards, a touchdown and three interceptions. Smead had three catches for 113 yards and the score. 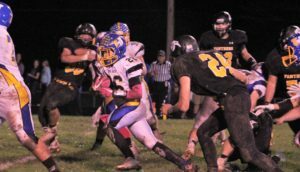 STRATTANVILLE, Pa. – Elk County Catholic grabbed control of the D9 League Small School Southern Division with a 26-16 win at Clarion-Limestone. While the victory creates a three-way tie atop the division between ECC (5-2 overall, 3-1 D9 League Small), C-L (5-2, 3-1) and Curwensville (5-2, 3-1), a winner over Redbank Valley Friday, ECC holds victories over both C-L and Curwensville and would need only to beat Keystone in two weeks to claim the first divisional title. Two unanswered third-quarter touchdowns – one from Alex Breindel on an 18-yard pass from Brennen Klawuhn and the other on a 9-yard Stephen Bobby run helped the Crusaders overcome a 16-12 halftime deficit. Breindel’s touchdown came on the opening drive of the half for ECC, which got the ball to start the half and gave them the lead for good. The Crusaders defense did the rest forcing turnovers on C-L’s first two possessions of the second half, including a Breindel interception, and then blocking a Lions punt on their third possession. C-L turned the ball over seven times in the game – four interceptions and three lost fumbles. The Lions, who played the entire second half without start Austin Newcomb who was out with an injury, managed just 86 yards after halftime, including only 32 in the third quarter. This after a 183-yard first half for the Lions that saw Newcomb rack up 133 of those yards – 91 on the ground and 42 in receiving yards – and a touchdown. Newcomb helped C-L overcome an early 12-0 deficit giving the Lions the lead at 16-12 on a 1-yard run midway through the second quarter. Aiden Wiles, who added 80 yards on nine carries, scored the Lions first touchdown with a 6-yard run. ECC went ahead 12-0 on touchdowns from Bobby (47-yard run) and Breindel (7-yard pass from Mason McAllister). Bobby had a big game with 33 carries for 139 yards and the two scores. Breindel added three catches for 26 yards and the two touchdowns while also coming away with the interception. 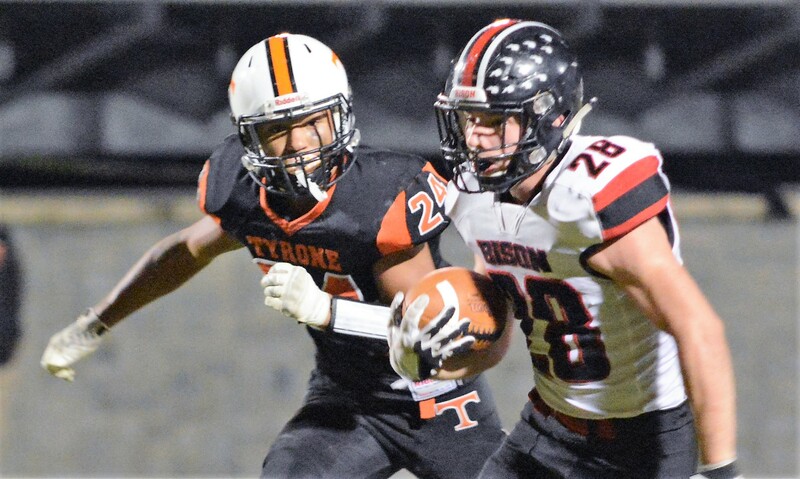 TYRONE, Pa. – After falling behind by a touchdown early, Clearfield rolled off 35 straight points on its way to a 35-7 road win over Tyrone in a game that saw quarterback Isaac Rumery set the school’s career record for passing yards. Rumery threw for 191 yards and two touchdowns on 13 of 18 passing – he also added 11 carries for 41 yards – to give him 6,103 career passing yards breaking the previous mark of 6,088 set by Chad Kroell in the mid-1990s. Rumery’s passing was part of a balanced offensive attack by Clearfield, which also ran for 199 yards led by Brett Zattoni’s 82 yards and two touchdowns on 16 carries. Caleb Freeland chipped in a rushing touchdown and had eight carries for 72 yards for the Bison, while Jake Lezzer (4 catches, 58 yards) and Barrett Cline (1 catch, 23 yards) scored through the air for Clearfield. Taye Lynch (59 yards) and Spencer Graham (40 yards) also had three catches each. Lynch played a key role on defense with two interceptions. The victory keeps the Bison (7-0 overall, 5-0 Mountain League) unbeaten and sets up a first-place showdown next week at Bald Eagle Area (7-0, 6-0), who beat Huntingdon 30-7 Friday night. Clearfield used a balanced offense that ran for 199 yards and threw for 191 to get the road win this week. ST. MARYS, Pa. – Welcome back Jack Krug. Playing for the first time since hurting his shoulder in the second game of the season against Brockway, the Brookville sophomore quarterback didn’t miss accounting for 377 yards of total offense in just the first half – Robert Keth played the second half – in a 63-32 win at St. Marys, the third straight win for the suddenly-red hot and dangerous-again Raiders (4-3). Krug was 10 of 12 passing for 307 yards and five touchdowns and added four carries for 70 yards. Brookville needed just 41 plays from scrimmage to rack up 666 yards of offense, an average of 16.2 yards per play. Cabe Park hauled down six catches for 285 yards and four touchdowns, his second game this year of at least 285 yards receiving after he set the school record in the opener against Bradford with 290 yards. Bryan Dworek chipped in seven grabs for 106 yards and two scores. On the ground, Bradan Eppley (9 carries, 73 yards) scored twice with Tucker Wolfe (8 carries, 90 yards) scoring once. After replacing Krug at halftime, Keth was 5 of 7 passing for 113 yards. St. Marys (0-7) got a pair of touchdown passes from Todd Taylor, who was 9 of 16 for 101 yards while also throwing a pick. Jackson McClain ran 17 times for 161 yards, while Devin McGrath had 18 carries for 83 yards and a touchdown. Cain Pfoutz and Josh Robinson had touchdown catches for the Dutch. PUNXSUTAWNEY, Pa. – Three long second-half touchdown runs – two by Donny Pattison and one by Jaron Ambrose – helped visiting Bradford pull away from Punxsutawney for a 34-14 win. The Owls (4-3) led 14-7 at halftime and 21-14 after the teams traded touchdowns to start the second half before Ambrose broke free on an 80-yard jaunt to make it 28-14 at the end of three quarters. That touchdown came just 21 seconds after Carter Newcome had caught a 14-yard touchdown pass from Dylan Ishman for Punxsutawney (2-5) to make it a seven-point game. Then Pattison, who opened the second-half scoring with a 57-yard run, took off on a 66-yard spring midway through the fourth quarter to put the game away. Pattison ran 19 times for 216 yards and the two scores with Ambrose, who also scored on a 17-yard first-quarter run to help Bradford take a 14-0 lead after a quarter, adding 12 carries for 169 yards and the two touchdowns. Caleb Nuzzo added a 2-yard touchdown pass for Gaige Campbell to open the scoring for Bradford. Newcome scored both of Punxsutawney’s touchdowns also hauling in an 11-yard pass from Ishman in the second quarter. He caught 13 passes for 126 yards and the two touchdowns with Ishman going 20 of 39 passing for 234 yards, two touchdowns and a pick while running for 36 yards on nine carries. Max London chipped in three catches for 77 yards. KARNS CITY, Pa. – Thirty-six unanswered points helped Karns City overcome a one-point deficit midway through the second quarter on its way to a 43-7 win over visiting Kane. Ted Race’s 5-yard run followed by Aaron Hottel PAT gave the Wolves (1-6) at 7-6 lead with 7:26 left in the first half. But Devin Ryan’s second touchdown of the opening 24 minutes on a 14-yard pass from Josh Wimer on a trick play gave Karn City (3-4) a 14-7 halftime lead, and the Gremlins then scored 29 unanswered second-half points including 22 in the third quarter. Anthony Kamenski had a touchdown run and a touchdown pass to Erk Pfeifer in the third quarter, while Hunter Jones added a touchdown run in the quarter and Mitchell Kelsea tacked on a fourth-quarter scoring run. Jones led the Gremlins with 17 carries for 102 yards and the touchdown, while Ryan, who also scored on a 28-yard run in the first quarter, ran seven times for 58 yards and the score and caught one pass for 14 yards and the touchdown. Kamenski was 5 of 11 passing for 51 yards. Jake Alcorn paced Kane, which was playing without quarterback Zuke Smith, who was hurt in practice this week, with 18 carries for 79 yards. Alcorn was also 3 of 12 passing for 11 yards with two interceptions. Aiden Hulings chipped in 16 carries for 52 yards. EMPORIUM, Pa. – Led by two touchdowns from Blake Kinner, seven different Smethport players scored to help the Hubber remain unbeaten with a 56-6 win at Cameron County. Kinner ran five times for 150 yards and two touchdowns to lead a balanced Smethport attack that also saw Bradeon Johnson pick up a touchdown and 70 yards on five carries. Grant Ognen ran for a touchdown and threw for another in the win with Alex Sanderson catching the score. Nathan Hollowell, Bryent Johnson (on a pass from Noah Lent) and Hunter Lent also scored for the Hubbers (7-0 overall, 4-0 D9 League Small North). Smethport’s lone touchdown came on a 68-yard Conner Nolan to Nick Peters screen pass. But the Red Raiders (1-6, 1-3) managed just 23 yards of offense the rest of the game. 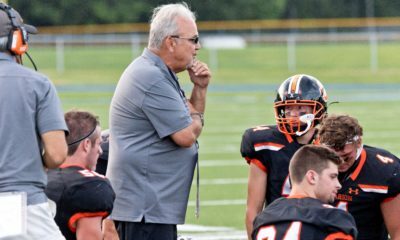 The win sets up an old-fashion Smethport vs. Coudersport contest in two weeks for the first-ever North Division title. That game will be played in Coudersport Oct. 19. COUDERSPORT, Pa. – Coudersport did its part in ensuring its game with Smethport in two weeks will be for the D9 League Small School Division North title by rolling past visiting Otto-Eldred 47-6. After a scoreless first quarter, it was all Falcons (5-2 overall, 4-0 D9 League Small North) who scored 47 straight points before Otto-Eldred (3-4, 2-2) scored a late touchdown. 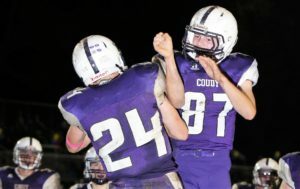 Stephen Kelly and John Minor both scored twice for Coudersport with Kelly scoring on runs of two and 17 yards and Minor on a 26-yard pass from Hayden Keck and a 47-yard interception return. Minor’s pick-6 in the fourth quarter was the second non-offensive touchdown for the Falcons, who also scored when Travis Gleason returned a blocked punt five yards for a touchdown in the third quarter. Kolby VanWhy and Thomas Wilson added rushing scored for Coudy. Colton Gietler returned a kickoff 81 yards following Wilson’s score for the lone Otto-Eldred touchdown, as the Terrors were limited to 43 total yards of offense including negative seven rushing. Kelly ran 28 times for 179 yards and the two touchdowns with Minor catching two passes for 57 yards and the score. Keck was 2 of 5 passing for 41 yards and the touchdown and added 12 carries for 32 yards. Cole Sebastian was 11 of 23 passing for 50 yards and three interceptions for Otto-Eldred. Ethan Smith hauled in five passes for 19 yards. CURWENSVILLE, Pa. – Blake Passarelli ran for three touchdowns and 113 yards to help Curwensville to a 37-21 win over visiting Redbank Valley. Passarelli scored on first-half runs of 4, 17 and 10 yards. Cole Bressler added a rushing touchdown for the Golden Tide (5-2 overall, 3-1 D9 League Small South) who also got an 82-yard kickoff return from Dakota Bloom and a 25-yard Jacob Mullins field goal. Hunter Buzard scored twice for Redbank Valley, once on a 9-yard run and a second time for a 68-yard punt return. Keaton Kahle added a 2-yard scoring run. Kahle was also 12 of 20 passing for 176 yards and an interception. Bressler chipped in 73 yards rushing on 14 carries, while Avery Francisco added four totes for 20 yards and played a key role in a Curwensville defense that limited Redbank Valley (4-3, 2-2), losers of three straight, to just 178 yards. Francisco talked about the win. BROCKWAY, Pa – Peter Downer threw a pair of touchdowns and ran for a third, and Ben Glasl opened the scoring with an unreal offensive fumble recovery and touchdown run off a fumbled punt to help Brockway knock off visiting Moniteau, 31-12. The win improves the Rovers to 5-2 on the season with Moniteau falling to 3-4. Downer went 12 of 25 passing for 218 yards with touchdown passes of 25 yards to Garrett McClintick and 14 yards to Josh Solnosky. He also ran for a 1-yard touchdown. Zane Puhala hit another field goal for the Rovers, this one from 28 yards. Moniteau ran for 330 yards led by Chance Nagy’s 20 carries for 180 yards and a touchdown. Nagy was also 11 of 23 passing for 83 yards. 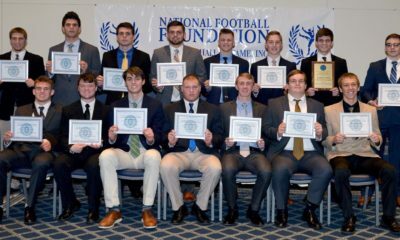 Cody Wise added 15 carries for 96 yards and two catches for 20 yards and made a team-best seven tackles on defense, while Nick Martino also scored a touchdown on the ground while rushing nine times for 29 yards and catching four passes for 20 yards. Martino added six stops on defense. WATERFORD, Pa. – Fort LeBoeuf held off a furious fourth-quarter rally by DuBois to knock off the visiting Beavers, 18-10. DuBois (2-5 overall, 2-3 D10, R7) trailed 18-0 heading to the final 12 minutes but got an early fourth-quarter touchdown catch from Michael Eisman on a 16-yard pass from Alex Kovalyak and then added a 21-yard field goal from Dylan McCluskey with 3:20 to play. The Beavers had one last chance to tie the game, but Kovalyak’s second interception of the game sealed the victory for the Bison. Kovalyak was 11 of 25 for 145 yards, the touchdown and the two picks. Chase Husted had six catches for 107 yards with Blaise Carney rushing 11 times for 65 yards. Tynan Mazur ran for 144 yards and a touchdown for Fort LeBoeuf (5-2, 4-1) and caught two passes for 48 yards and a touchdown. Andrew Lichtinger added a rushing score for the home team. KNOX, Pa. – Quinton Weaver knocked away a fourth-down pass from the Union/A-C Valley 20-yard line by Keystone quarterback Isaak Jones in the end zone with 1:44 to play, and the Falcons Knights held on for a 12-8 road win over the Panthers Thursday night. The game ending with Keystone being stopped deep in Union/A-C Valley territory was a fitting end for the Falcon Knights defense that bent but didn’t break allowing 315 yards but no touchdowns after Keystone scored on its opening driving. Weaver talked about this final play and the win for Union/ACV after being named the Hager Paving Player of the Game. All the scoring took place in the first half with Keystone taking 6:24 off the clock on the game’s opening driving before scoring on a 6-yard Jones scramble. But Union/A-C Valley scored twice early in the second quarter with Caiden Rainey finding paydirt from three yards out and Luke Bowser hitting Tanner Merwin with a 20-yard touchdown pass that proved to be the game winner. Keystone outgained Union/A-C Valley 315 to 139 including 204 to 42 through the air, but the turnovers killed the Panthers, who weren’t able to force a giveaway of their own. Caiden Rainey of Union. Photo by Jared Bakaysa. Jonathan Powell led the Falcon Knights with 12 carries for 60 yards with Rainey adding seven for 30. Bowser was 3 of 11 passing for 42 yards and the touchdown with Rainey catching one pass for 21 yards and Merwin one for 20 and the score. Jones was 12 of 23 passing for Keystone for 204 yards but threw three interceptions. He also ran 11 times for 31 yards and the touchdown. Nick Weaver had a game-high 66 yards rushing on 22 carries and caught two passes for 33 yards. Brandon Kapp had four catches for 61 yards. Nolan Cumberland had a team-high eight tackles for Union/A-C Valley with Cullen adding seven tackles, a sack and an interception. Rainey had four stop and a pick with Merwin also adding an interception.